There is no other material on Earth like natural stone. Formed from millions of years of geologic forces, natural stone is quarried from different parts of the globe to make its way into our everyday lives in the form of countertops, floor tiles and many other building materials. It is one of the most beautiful and durable construction material available. Here you will learn about the History of Stone, as well as the different types of stone and how they are most commonly used. Travertine is a type of sedimentary rock that is formed by the biological and chemical processes that occur in fresh water hot springs and small rivers. The name evolved from the Latin words lapis tiburtinus, meaning stone of Tibur, which is modern day Tivoli where this rock is quarried in abundance. Travertine forms in fine layers over long periods of time and is usually a quite porous material. Iron oxides and hydrates influence the colors which vary from yellow, tan, brown, grey and even reds. Travertine’s beauty and durability make it an excellent building material for non-load bearing indoor and outdoor applications. Limestone is a sedimentary rock comprised of at least 50% calcium carbonate. It is the most common of all types of carbonate rocks which formed from the consolidation of calcium-based sea life over millions of years. Limestone has been used on many types of architectural structures throughout the ages from the Sphinx at Giza, to famous buildings in Europe and many home facings even today. Limestone can range in porosity and strength, and therefore more detailed information on its sourcing should be considered when using outdoors. Marble is a limestone (sedimentary) that has gone through metamorphic changes due to intense heat and pressure over time. This recrystalization process dissolves the fossils, and the growing crystals interlock and close the previous pores and eliminate the layers. Other minerals and bituminous material which is present in limestone, can also change due to metamorphism and result in the variety of different and beautiful colors present in most marbles. Pure white marble (Vermont marble as an example) has been sought after by sculptors throughout time for its beauty in the finished form. Marble in general has a very low porosity, and therefore is a very good choice as an outdoor material for its weather ability. Marble is however susceptible to acid-rain and acidic soils due to its calcium base. Granite, one of the hardest commercially used stones, is formed by the slow cooling of magma underneath earths crust. As the magma cools, course-grained interlocking crystalline structures are formed. Granite is composed of quartz, feldspars, micas and traces of various other minerals which fused into the molten rock. The word granite comes from the Latin word granum meaning grain. This highly dense and low porosity stone is the most common rock below the sedimentary layer of the earth’s crust and therefore sourced from all over the world. Granite comes in a variety of different colors based upon the mineralogy where it is quarried and is often a prized material for use in residential and commercial applications due to its aesthetic qualities. 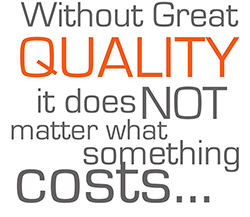 For all of these reasons, it is obvious to see why granite is an excellent choice if selected for outdoor designs. Slate is a metamorphic rock which formed from sedimentary shale (clay mixed with ash) under low heat and pressure over time. It is mostly comprised of quartz and muscovite or iolite, as well as other minerals, and has two different lines of breakability, allowing it to be easily split and utilized for many different applications. Some applications include patios and walkways, roofing shingles, wall facing and billiard tables. The commonly known “blackboard” was slate before the more often used green board of today. It is chemically inert and therefore can be a good material to consider for outdoor applications. Its rough appearance, as well as interesting blend of colors (due to other minerals present with the stone) make it often used for architectural applications. Quartzite is a very hard rock which formed by the metamorphism of quartz sandstone. The original quartz sand grains and/or quartz silica cement and fused together by extreme heat and pressure. Quartzite occurs in different shades of pink and red depending on the amount of iron oxide. Pure quartzite is usually white to gray in color, but can also be purple or green. Quartzite is very strong and can withstand chemical weathering. The resistant ridge and hilltops where it is found are often bare with little vegetation. Sandstone is a sedimentary stone formed by the compacting of layers of sand sized grains (usually quartz and feldspar) due to the pressure from overlaying layers of sediment and by the cementing of the grains together through a precipitation silica and calcium-carbonate (most commonly). This sand is deposited over time by water or wind. Other minerals present will affect the color of the stone. For example, a presence of iron oxide creates the orange and red colors that are famous in areas throughout the southwest (Antelope Canyon, Arizona). Sandstone is used architecturally and is a durable material for outdoor use. Flagstone is a generic description of a sedimentary rock that is commonly used outdoors on patios, barbecues and walls. It is sandstone mostly comprised of quartz and can be found throughout the world wherever sedimentary rock is formed. Pennsylvania Bluestone is also considered a type of flagstone, but it contains feldspar (which give it it’s blue color). Flagstone’s rough texture and irregular shapes make it a much desired material for outdoor settings. Utilizing flagstone that is sourced from local quarries is recommended since it will wear well under the local elements it was formed under. For the rustic, old world look of South America and the Southwest, saltillo tile is still hand-made in the town of Saltillo Mexico as it was centuries ago. Clay from the Saltillo valley is formed into varying sizes of bricks and tiles and then goes through a process of sun-drying and kiln firing. During the drying process, cracks and “popping” occur that give this tile is distinctive weathered look. Its placement and stacking while in the kiln produce the different colors and hues that usually include reds, oranges and yellow. Other manufacturers in Mexico have commercialized the process of making saltillo tiles by a method of compression prior to placing in the kiln. These tiles are generally denser than those from the Saltillo Valley with more rounded edges. 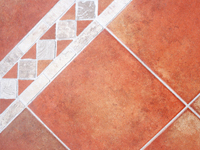 Saltillo tile is very porous and easily stained, therefore not the best choice for an outdoor patio, yet this material is often used in those very same outdoor environments. 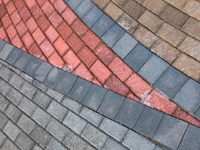 An acrylic type sealer is often applied to saltillo to help protect its surface, but in an outdoor setting it is not recommended since it will close off the stone and not allow the necessary water vapor transmission required. 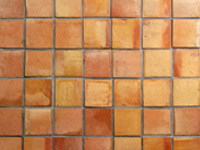 Terra cotta is low-fired ceramic clay, which can be glazed or unglazed. The Greek word keramikos means baked earth. This hard baked mixture of sand and baked clay usually contains enough iron to create orange or reddish color hues. The clay is cast or molded into the desired form and then kiln fired and cooled. Unglazed terra cotta is porous, but has been used by ancient cultures to carry water and oils. Many homes in the south and south-west are protected with terra cotta roof tiles. Be aware of its high porosity and weaker structure when using in any outdoor application. Clay Brick is a natural mineral, mainly aluminum silicate converted or fused under the action of very high temperatures. 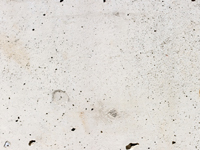 Concrete consists of cement, aggregate (clay and limestone) and water. When this composite is mixed together the resulting chemical action hardens and sets into a rock-like mass. Many ancient cultures such as the Egyptians and the Romans (who perfected it) were masters at the use of this ingenious mixture. The formula was lost to civilization during the dark ages of Europe and was only re-discovered again in the mid 1700’s. Minerals are the building blocks of stone and surround us in the environment. Deposit mineral grains are found in soil, gravel, sand and rocks. There are even mineral deposits in the air we breathe. German crystallographer, Fredrich Mohs, was the first person to rank minerals in order of relative hardness by their ability to scratch one another. His scale is still used today by mineralogists. Minerals form when and where temperature, pressure and chemical environment exists over a long period of time. The length of time allows the component atoms to become ordered into a crystalline structure. Formation time may occur over limited or broad range conditions. Rocks actually contain a record of events that occurred during our Earth’s long history. There are three major types of rock families; Igneous, Sedimentary and Metamorphic.